Universal knee support features Microban antimicrobial technology to help prevent the growth of stain-causing and odor-causing bacteria. Flexible spiral side stabilizers protect both sides of your knee to firmly support tendonitis, sprains, strains or injured knees. Round buttress pad encompasses the knee cap for enhanced patella stabilization. Perforated, breathable material allows air to flow freely to help keep your leg cool as you move throughout your day. Wraparound design allows a tapered fit to ensure maximum comfort throughout your entire day. 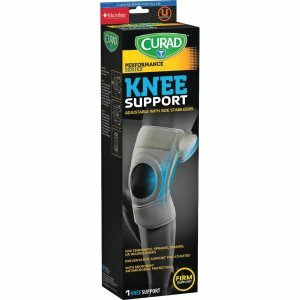 Knee support is designed to support either your left or right knee.